B4RN AGM 2017 was held at Queen Elizabeth School, Kirkby Lonsdale. 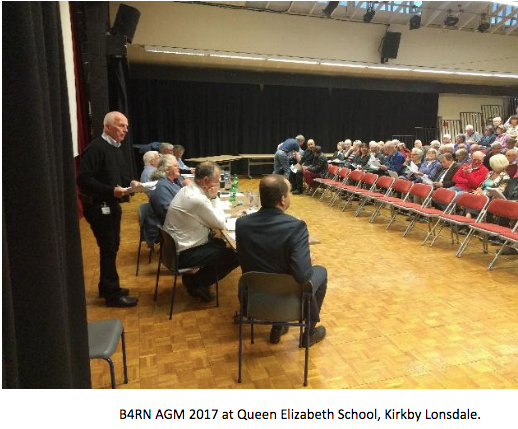 Queen Elizabeth School, Kirkby Lonsdale very kindly hosted B4RN’s sixth AGM on the 10th October 2017. 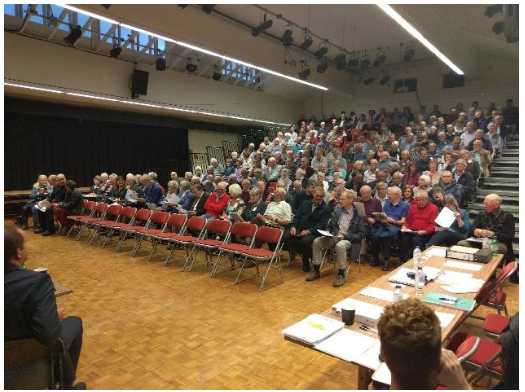 There was a good turn-out, with 163 shareholders in attendance, and an additional 136 proxies. Members were welcomed by Company Secretary and Director, Monica Lee, who introduced CEO Barry Forde MBE, who gave a presentation on the progress of the company. Barry’s presentation included details of the new staff, introducing Finance Director, Andrew Brocklehurst, and Community Liaison, David Ryall. B4RN now has a Civils Team: Nick Hall (Head of Civils), James Taylor and Sam Robson (Civils Operatives), as well as a Network Team: Simon Dole (Network Engineer), Joseph Brown and Matthew Mercer (Trainee Engineers). B4RN are still looking for a Senior Network Engineer to support Tom Rigg. B4RN is proud to be working towards true resilience, and now makes use of 480 Km of Dual fibre between Edinburgh and Manchester. This means that if one route is broken the service automatically switches to another, and there is no loss of service on the core routes. B4RN now covers approximately 1800Km2, equivalent to the area inside the M25 and is achieving approximately 150 connections a month, forecast to reach over 5000 connections by next summer. At the last AGM it was reported that there were 25 nodes (parishes) live. These have been joined by 17 more this year, and there are a further 15 under construction or planned. Local expansion plans include Middleton CP, Overton CP, Thurnham, Cockerham, Forton (West of M6 south of Lancaster towards the coast), Docker, Greyrigg, Winfell, Tebay, Ravenstonedale, Kirkby Stephen (North of Sedbergh) and Hawes, Stainforth, and Horton in Ribblesdale (on the Eastern side). More distant expansion plans include East Anglia, Allen Valleys, Northumbria, Cheshire West, the Surrey Hills, and the Scottish Borders. The company has been almost entirely community funded with 1693 shareholders now holding a total of £4 million in shares with an additional £2.8 million loaned to the company from the community. There was lively discussion around a few key concerns. Barry was asked for assurance that expansion into more distant areas wouldn’t compromise the local build out. He stated that there was no change in policy and all areas, whether local or distant were self-funding, and accounted for in the same way. Barry reiterated that B4RN is not financially driven to expand the network, and that it is simply a case of ‘help thy neighbour’… in this case B4RN helping further communities to help themselves. Hornby Swimming Pool was raised as an example of a community project that would benefit from funding, and shareholders were assured that once B4RN was generating sufficient income, the income would be returned to the community in a variety of ways. Landowners were thanked for their gift of wayleaves for the core routes across their land that play a vital role in maintaining B4RN service. Without this B4RN would not exist. It was agreed that the directors would consider ways of recognising this gift. Further questions included discussion of the potential effect of earthquakes on B4RN, and the possible limiting of shares in the future. Tim Preece was on hand, representing Scott & Wilkinson LLP. There were very few questions and the accounts and auditors report were adopted, and Scott Wilkinson were reappointed. Directors Chris Carr and Peter Hearne were re-elected, and new director Ian Thompson was elected to join them. Two minor rule changes were agreed, and shareholders were advised that further minor rule changes would be brought to the meeting next year to bring B4RN in line with current legislation. Many of the shareholders present at the AGM stayed afterwards to speak with the friends and colleagues over tea and biscuits. Many are actively digging and used the opportunity to discuss practical considerations, but others present were from communities that finished their connections some time ago. All enjoyed catching up with the many other ‘b4rnstormers’ they’ve met from neighbouring communities while working on the project.